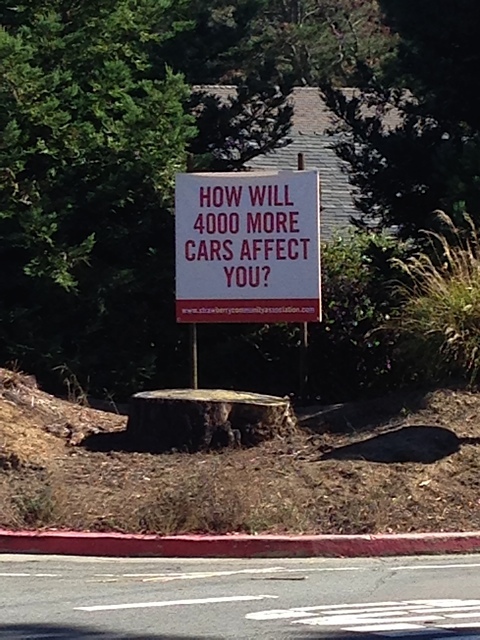 4000 Additional Daily Vehicle Trips in Strawberry? Maybe you’ve seen the signs at the corners of Seminary and Ricardo, or on E. Strawberry across from Strawberry Point School, or attended the community “visioning” meeting at the Strawberry Rec Center. If you don’t know what’s happening in the neighborhood, or if you’re affiliated with Branson and don’t know what it means, it’s time to find out what the Strawberry community is highly concerned about. The Seminary Neighborhood Association recently commissioned a traffic study by a respected Marin traffic expert based on the proposal being discussed by the Fasken Trust. – 300 rental townhomes averaging significantly larger square footage than the current student/faculty housing, housing not dedicated to the school but available to anyone. The study found that over 4000 additional vehicle trips would be added – daily – to local traffic from these changes to the neighborhood. The current Seminary housing is for students and faculty, and many of the school attendees live on campus. With the new proposal, both the school *and* the housing would be generating significant additional traffic. The main reason the Branson headmaster (well, former Branson Headmaster) gave community groups for moving to Strawberry is that the Town of Ross has strict limits on their growth – they are limited to 320 students. Townspeople in Ross don’t want to be “townies” in their own community, and don’t want the traffic, noise and general activity of a larger school to change the nature of their town. For some reason, the Branson board and the Fasken Trust think that the people of Strawberry want this. And not just a larger school – the 800-1000 person target would make this new Branson the LARGEST private high school in Marin. Imagine the traffic building up at the Seminary exit and on Tiburon Blvd in the mornings when students, faculty and administrators are arriving for school, and adding to the traffic jam on E. Strawberry by Strawberry Point Elementary at the end of the schoolday. And imagine the additional traffic coming out of Strawberry from those 300 additional market units – no longer occupied by student and faculty for the Seminary – in the mornings and at the end of the day. The Strawberry Community Plan and the Seminary Master Plan – which govern development of this land – describe these specifically as “student/faculty housing.” These have never been contemplated as publicly available units in the agreements made between the county, the Seminary and the community. The additional traffic generated by these units beyond the bounds of those agreements would have a major impact on our community. We oppose Branson’s move to Strawberry at the numbers they are proposing. If they want to move to Strawberry because the views are better, or because they like the access to the highway, or because the neighbors can be really great here when approached the right way with proposals that respect the community – we might welcome them. But if the reason they want to move here is in order to build a bigger high school that will completely change (for the worse) the living and traveling conditions of our community, because the people where they currently live won’t let them do it to their neighborhood – then no, we don’t want them here.